Bannies can walk through at several parts between the big columns but it will not be evenly spaces between all colums. I was thinking of putting a light color marble paver blocks a little bit above the ground level. Because of the spacing between the colums allowing visible roads will look odd as some roads will not be nicely centered between all the columns and some even go slightly into a column. Wow, @embx61 you're on fire! Amazing work. Beautiful! That came out wonderfully, Embx! Added the doors and windows in the side buildings. Changed a few textures as the originals where not seamless and although it was hardly noticeable I changed them anyway to seamless ones. Added the reliefs around the building and inside the walls of the middle part of the gate. Footprint is currently 30x16 Including a road. I added a footprint at +4 above ground with a floor object. Still roads can be build on three parts through the gate and a side one just at the back of the side buildings. About all the plaza inside can be road build but because of the footprint the roads will not be visible but the bannies gain the speed of the roads. Tomorrow I start with the build stages and AO mapping and think I can release in a day or 2. You've done a great job on this. Can't wait to see it in game! 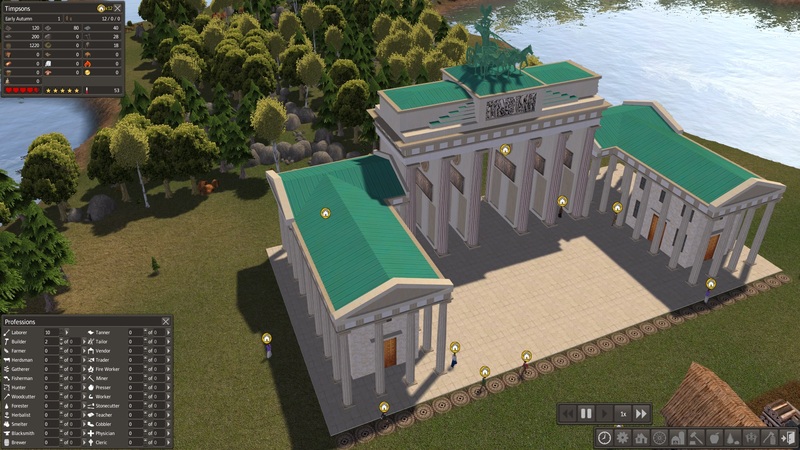 the 4 build stages of the Brandenburger Tor are done and poly went up to about 39000 poly total so it could have been worse. Take a little break and later do the AO mapping. It looks like I can probably release later today. Have to figure out the resources needed to build it and the work time. Logs, Iron, Stone, and copper, and some glass will be needed to build this building. As no ideas what the building function can be I decided just a passive happiness with a hidden radius of 200. If players want it I can make it a Town hall too as that will work together with happiness. It will be a building what will be quite expensive and take a long time to build and only 1 can be build. It is a landmark after all and should be a huge project for the bannies to build. I stand open for suggestions about build time and the needed resources and function. @Kimbolton not wanted Nomads and I can agree with that so even if it become a Town Hall as well I will take out and hide the Nomad stuff. @RedKetchup, I think it is possible to have the Town Hall not having Nomads? yes it is EB. KID has several modded TH's that don't bring nomads. My suggestion for build costs: 4000 stone, 1200 iron, 600 logs, 500 copper and 150 glass. And 50 thousand work units. I think it would be good to be a town hall with a wide happiness radius. I don't want it to take 50 thousand work units, as Gatherer suggested. That is too much. Mr. Red's cathedral in NMT 2.0.4 required 16 thousand work units and could be finished in 2 years with 4 workers. I wish i knew what the average builder work time is in about a Banished Year. Then I can do a calculation based on that. 50.000 seem to me also pretty high but with 12 builders assigned it will be 50.000 / 12 = 4160 units per builder. The question is how many build cycles a builder makes in a year on average? I think we cannot set the speed of builders like the professions and I think it is 4-4 or maybe 4-5 for builders so that is pretty fast. AO mapping almost done and will do some testing on build times. I just for testing shake emit the glass and Copper from the needed resources because Luke never fixed the Debug so we cannot add those resources directly so I have to setup a chain for glass and copper. (I will email him about that as I think even he not really working on Banished anymore bugs should be fixed or give us the code for the Debug so we can fix it ourselves ) and let the game run with 3 builders run for a year to see how much building is done in that year. Bannies are behaving different from game to game so it will not be hard figures but close enough so it all make sense in a certain way. While I want it to cost something I not want it to make it crazy long either (Like 10 or 20 years) so hardly anyone will build it. I have emitted the circle but if players want the circle to show when the building is selected or pinned I will enable it. 200 radius is a huge circle and when placing the building the circle is not even in view. 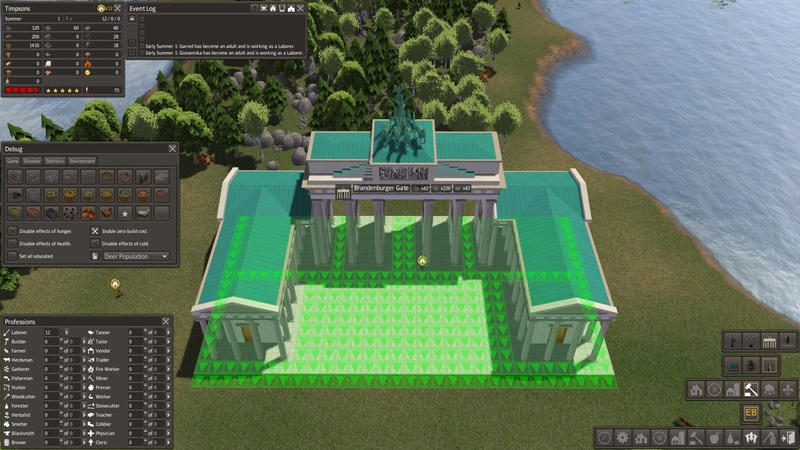 I will implement the Town Hall function and emit the immigration part and hide the immigration Tab from the UI. Then a spirit happiness, no worker needed so a passive always working one, with a radius of 200 but stand open for suggestions as I build all my mods for the players, not myself. .
Ah, thanks for that information. very helpful and save me some testing. I allow at the moment a max of 12 builders so 3x16000 is 42000 for it to be done in about 2 years. I was just as Granny thinking 50.000 as very high to but I think Granny and me not directly thought of the amount of builders a player can assign. So either 42000 with 12 builders so it will be done in about 2 years or less workers and less building time but it will be about the same in speed I think. I can do 6 builders and 21000 work units. It will be the same as 12 builders with 42000 work units. Was 4 builders the maximum in the Cathedral?